Dozens die in Beirut suicide blasts Jump to media player Two suicide bomb attacks have left at least 37 people dead and wounded 181 others in a residential area of the Lebanese capital, Beirut. Beirut blasts death toll rises Jump to media player At least 37 people have been killed and 181 injured in two explosions in the Lebanese capital Beirut, officials say. Two suicide bomb attacks have left at least 37 people dead and wounded 181 others in a residential area of the Lebanese capital, Beirut. 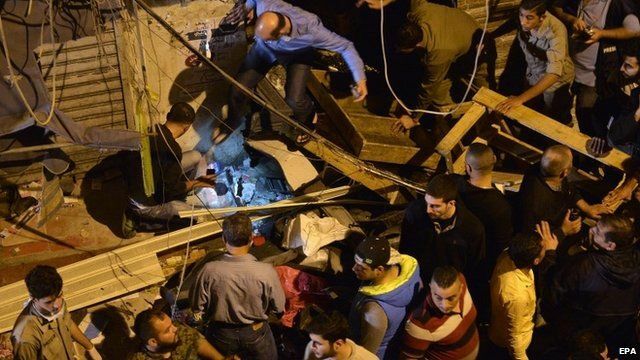 The bombers blew themselves up in a busy street in the southern suburb of Burj al-Barajneh, a stronghold of the Shia Islamist Hezbollah movement. The Sunni jihadist group Islamic State (IS) claimed responsibility, but there has been no independent confirmation. The BBC's Quentin Sommerville said the attack appears to be some kind of retribution for Hezbollah's support of Syria's President Assad.